If you are a golf avid, you might be remembering the 60-foot putt Tiger Woods faced during the 2001 PLAYERS Championship. Hole #17 at TPC Sawgrass, an iconic, yet infamous to some, island green provides the backdrop for one of golf’s toughest challenges. Not surprisingly, some of the best and worst shots in golf have been made on this short par 3, but one of the most memorable, remains Tiger’s “better than most” putt where he sank the long, highly undulated putt to eventually win by 1-shot. Sorry golf fans, this post is not about Tiger but rather a bistro in Budapest called “Most”, which as the title suggests, is better than most. 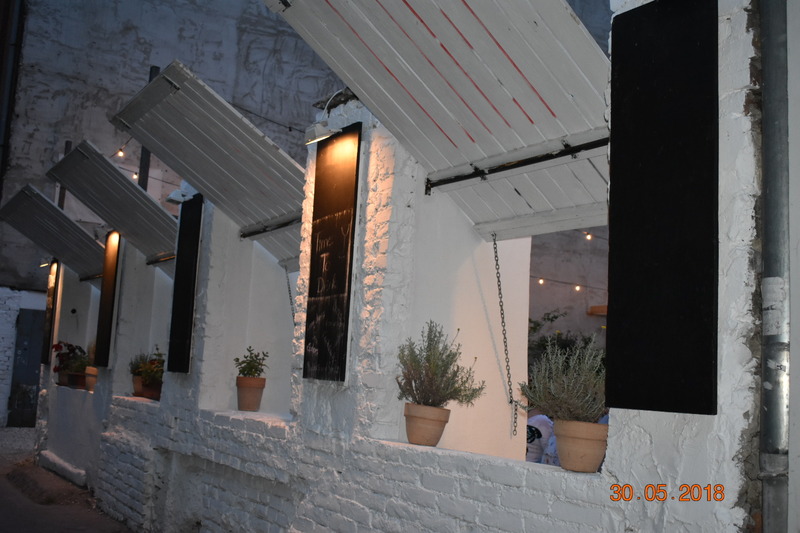 Situated near the Opera House and between Ó utca and Zichy Jenö utca, is a fantastic bistro with both indoor and outdoor dining. “Most” offers a casual atmosphere outside and inside with a unique style and decor. The exterior seating (found off Ó utca) has endless tables, some covered and some open-air with plenty of seating for large or small parties. The interior, which was tastefully decorated can be accessed from Zichy Jenö utca and can again, seat small or large parties. Given it is summer here, we chose to sit outside, as did the majority of diners given the relaxing atmosphere and beautiful summer evening. Although I have yet to experience a winter in Budapest, my guess points to the majority of diners sitting inside during the winter months! Menu wise, the options are diverse and plentiful. For picky eaters or foodies, you will not go hungry as the menu offers options for everyone. We ate for dinner and were presented with options such as homemade hamburgers, Asian dishes including wok, Hungarian specialties and Indian dishes. I also found other international options such as quesadilla, pastas and some Greek offerings. I chose the garlic chicken skewer with naan and to be candid, it was my favorite meal thus far in Budapest. The dish was flavorful, and was presented with a cabbage mix as the base. The portion size was nice and the prices were ace. My husband chose Mango Chicken, a curry-like dish with naan and he too was very impressed and satisfied with his choice. The drink selections were abundant but I chose the freshly made original lemonade. It was very refreshing and complemented my dinner nicely. To top the experience off, the staff were friendly, efficient and attentive. Whether you are in town for a day or living here like us, make sure you put “Most” on your list of gastro options. If your experience was anything like ours, you will not be disappointed as it is truly a dining option that is better than most. Good morning Ashley! What a great blog. I do remember Tiger’s iconic put, a great metaphor for your restaurant review! If we make it to Budapest someday we will make sure this is on our must do list. The sun has finally returned and we’re heading to play golf this am. Lennar is hosting a PB social tonight at the courts. It should be a fun day at LWN. Have a great day and looking forward to your next blog. Thank you for reading Donna and for the compliments! I am always appreciative of hearing from you and your continuous support. Miss you guys, hi to Bob and hugs to Trevi boy!